Not too long ago there was a beer fest in town which coincided with a monsoon it seems but it brought the lovely Kristen from Mommy Needs a Cocktail to my town so win-win. Anyway Me and Kristen got to spend some quality time talking and chatting and she gave me one of her newer shirts. I've since worn this shirt out and about several times and always get stopped by people who think its hilarious or ask me where i got this from. Kristen has an apparel store Baby Brewing which i hope most of you are familiar with, if not some of the products she offer include adult shirt like the first one i bought "Mommy wants a glass of wine" she also has maternity tees, as well as infant onesies and kids tees. 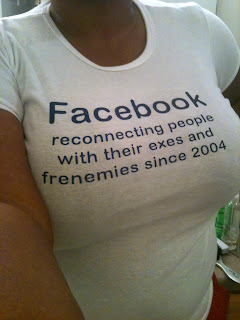 How true is this shirt!?!?! I hear all the time about drama on that site with people hooking up with high school old loves, yes i've even done it, girls who hated each other in high school send friend requests just to look at albums to see if they got fat or have fugly spouses. You know its true and this shirt says it all. The shirts for adults are American Apparel. I tend to look for places that use this brand because 1- i know what size i wear so i'm not guessing based on a sizing chart and suspected shrink rate, 2- these are high quality shirts. I wear t-shirts almost every day so these shirts go thru a lot of washings, i'm very aware of fading and any other signs of wear. As a special deal to all my readers I'm sharing with you a customer code giving you 20% off all orders from today till the end of August. (8/31), if you purchase this shirt from Baby Brewing enter "notthecar" in the box on the checkout page to get your discount. DISCLAIMER: I received this shirt free of charge because i am a friend of Kristen's and was under no obligation to review it or offer a discount to my readers. I have in the past purchased items from Baby Brewing and will continue to do so because of my personal feelings about the products offered.